As it reached the end of its first millennium in 1963, the monastic republic of Mount Athos seemed to have completed its life cycle and to be breathing its last. It had been born, grown to maturity, produced a rich harvest of fruit, and grown old. Its strength was shockingly reduced. The numbers of the monks had fallen considerably and their average age was now over fifty-five. The elders were dying naturally, without seeing younger men come to take their place in the monasteries and hermitages. Huge monastic complexes that had once pulsated with life now stood derelict and deserted. Everything betokened decline and decay. Certainly, this was not the first decline the monastic republic had experienced in its long history. Yet almost everyone believed it would be the last. Many of the monks, even, had come to believe that they would have no successors. And so, on the fringes of the millennial celebrations, it was being said that the festivities were in fact the 'funeral service' or even the 'requiem' for Athonite monasticism. The first decade of the second millennium gave every indication of confirming the gloomy prognostications. The monks' numbers continued to dwindle, the signs of depopulation were unmistakable, and the future looked bleak indeed. What was more, the notion began to glimmer in the minds of some of those responsible, and of others less responsible, that efforts should be made to exploit the inestimable treasures of this thousand-year-old republic as tourist attractions. But the prospects in this direction were not promising. Special studies showed that the cost of bringing tourists to Mount Athos and possibly of replacing the monks with custodians to look after and protect the treasures would be considerably greater than the anticipated revenue. While all this was going on, a curious change started to take place on Mount Athos, 'the Garden of the Virgin', as the monks like to call it. It was a change which not even the most sanguine objective view could have foreseen, a change which vindicated the naive and simple hopes of those Athonite monks who had always insisted that the Virgin would never allow her garden to be deserted. A rough head count carried out at the end of that first decade after the 'funeral service' produced an important indication, which attracted our close attention. In recent decades, the statistics had shown that the number of monks on Mount Athos was steadily falling; but in 1972, for the first time, the data showed that the number had not fallen but had in fact risen over the previous year, by one. There had been 1,145 monks on Athos in 1971; in 1972 there were 1,146. Apparently negligible then, but in fact highly significant, the increase has continued right up to the present day. The occasional down-turn in the generally upward trend has been due to the high mortality rate in the older monastic population. Thus, from 1972 to 1996, when the last census was taken, 1,036 new monks came to Mount Athos. More specifically, in the first five years (1972-6), 143 new monks arrived, averaging out at about 29 a year. Between 1977 and 1986, 284 new monks came, with the same average annual rate. And the decade 1987-96 saw the arrival of 609 new monks, an average of about 61 a year. So it is clear that the influx of new monks has not merely been sustained, it has in fact increased by more than 100% in the last ten years. The increase in the number of monks was not evenly distributed among all the monasteries. Until the mid-1970s, only eight of the twenty monasteries saw an increase in their population, while the numbers continued to fall in the other twelve. The eight were: Iviron, Chelandari, Karakalou, Philotheou, Simonopetra, St Paul's, Gregoriou, and Esphigmenou. Three of these (Philotheou, Simonopetra, and Gregoriou) showed a striking increase, which in the case of Simonopetra actually tripled the number of monks. This was because they did not arrive singly, but in groups known as synodeies, chiefly made up of young men from monasteries outside Athos, who had been invited by the remaining incumbents, alarmed by the relentless depopulation of their monasteries. In most cases, it was necessary to by-pass a number of formalities for the newcomers to take up permanent residence. Thus, a monastery which, having consulted the Holy Community, invited a group of monks, was contravening article 112 of the Charter, with regard to the age of the group's spiritual father or the place where he had been tonsured, in permitting him to live on Athos and to become a hegumen. In the initial period of the resurgence of monasticism on Mount Athos, there was a tendency for synodeies to move en bloc from dependencies, which contained about three fifths of the Athonite population, to monasteries. However, owing to the ramshackle state of the monasteries, the lone individuals arriving to take up the monastic life did not stay in the monasteries, but preferred the sketae and hermitages, where they lived an ascetic life and exerted a considerable spiritual influence. It was in the 1950s that the synodeia of Father Joseph Spelaiotis started to come together, followed in the 1960s by that of Father Padsios. The growing membership of the new synodeies, which brought with it an increased need for housing, made it difficult for them to continue in the dependencies. The need to seek more suitable accommodation became pressing; and this accommodation was now available in the monasteries, which were gradually falling empty and offered ample space to meet the growing needs of the synodeies. So flourishing synodeies were now invited to move into the depopulated monasteries. The new arrivals gradually took over the administration of the monasteries in which they settled, and made them suitable not only for their own occupation but also to receive new monks. In the second stage, from the mid-1970s onwards, monks began to move, again in groups, from the more flourishing monasteries to the weaker ones. Again the new arrivals took over the administration and running of their new abode; and thus was avoided a disproportionate increase in the population of some monasteries and the total depopulation of others. Early in the 1980s, there began a gradual movement from the monasteries back to the dependencies. Monks who had lived in the monasteries for some years and acquired the necessary monastic experience withdrew to dependencies, where there was more peace and quiet. And thus began the broader revival of the hesychasteria. The number of monks on Mount Athos is rising in inverse proportion to their average age, because almost all the recent arrivals are young men. Already the vast majority of Athonite monks have arrived within the past twenty-five years. This has had a rejuvenating effect on Athonite monasticism and fully re-established the age pyramid, reducing the average age to about forty-eight. Most of the monks today are aged between thirty-one and forty, and there are more and younger monks in the monasteries than in the dependencies. Furthermore, their level of education is appreciably higher than the average in the Greek population as a whole. Many of the novices have completed further or higher education and hold qualifications in a variety of disciplines. In the five-year period 1960-4, for instance, only three holders of university degrees took up residence on Mount Athos (2.8%), whereas today there are 343 monks (27%) with university degrees. Of these, 133 (10.5%) have degrees in Theology, and 210 (16.5%) degrees in other subjects. Only 1.7% of the monks today have not completed primary education. Regarding the organisation of monastic life on Mount Athos, there have been some rapid developments during this recent period. It is the coenobitic system, which rejects personal ownership of property, that is generally acknowledged as the truest form of collective monastic life. The idiorrhythmic system may be described as a development of the old lavran system: it has prevailed at various crucial turning-points in the history of monasticism, and permits personal ownership of property. All of the twenty sovereign monasteries on Athos today have passed through an idiorrhythmic stage at some point in their history. The Athonite Charter forbids a coenobitic house to become idiorrhythmic, though an idiorrhythmic house may become coenobitic (article 85). Twenty-five years ago, nine of the twenty monasteries were idiorrhythmic; today they are all coenobia. All the other monastic foundations on Mount Athos (sketae, kellia, kalyvae, hesychasteria, and kathismata) are under the jurisdiction of one or another of the twenty sovereign monasteries, as are the metochia outside Mount Athos, many of which are notable spiritual centres. 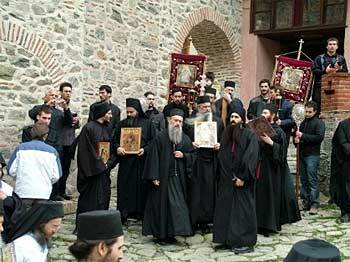 It is important to note that it is not only the traditionally Orthodox countries (Greece, Russia, Romania, Bulgaria, Serbia, Georgia) that are represented on Athos today: there are monks from many other parts of the world, including Britain, France, Germany, Canada, the Netherlands, Peru, Syria, and Africa. Athonite monasticism is thus truly ecumenical. It is vitally important that this ecumenical aspect be preserved and strengthened, for the sake not only of monasticism, but of the whole Church too. The source of this resurgence of Athonite monasticism may be traced to a number of powerful charismatic figures who have exerted a strong spiritual and moral influence. Some of them are still alive, others have died within our own time, but they all created powerful currents that attracted many to the monastic life. 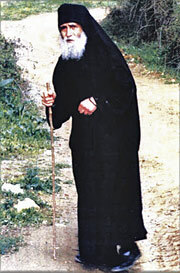 Those who have passed away include Joseph Spilaiotis (d.E1959), a hermit and elder who may be regarded as the spiritual father of six of the twenty sovereign monasteries; Father Padsios (d.E1994), who also played a part in the establishment or revival of some of the monasteries, and was a spiritual guide for many Athonite monks and countless other believers; and Father Sophronios (d.E1993), who, although he spent the last decades of his life at the Monastery of St John the Baptist in Essex, which he himself founded, lived on Mount Athos for more than twenty years (1925-47) and, through his book St Silvan the Athonite, brought many young men to the monastic life. As far as the form of monastic life is concerned, one notable feature of this early second millennium has been a certain coming together of the coenobitic and the Hesychastic tradition. The Hesychastic tradition with its continuous, internalised Jesus Prayer, which was cultivated almost exclusively in the hesychasteria, has entered and spread through the coenobia, and is now a fundamental aspect of coenobitic life. By the same token, the regular church services of the coenobitic tradition, which were once unknown in the Hesychastic tradition, have entered and become an established part of it. Regular services now structure Hesychastic life in almost all the hesychasteria on Athos. This interpenetration of the Hesychastic and coenobitic traditions has been accompanied by a certain broader rapprochement between monasticism and the secular world. It was always a feature of the Orthodox Church, but had flagged somewhat in modern times. The situation has now changed completely. Thousands of visitors flock to Mount Athos every year and experience for themselves the spirituality and the life of the monks. Similarly, through public talks, periodicals, and special publications, by taking a stand on serious ecclesiastical and social issues, and, even more, by offering individual spiritual guidance, the monks are strongly influencing the spiritual life of the Christian community and are making a substantial impact on the Church and society. The re-animation of religious life and the great interest in Orthodox spiritual life now being manifested both in Greece and in the Orthodox Christian world as a whole are a direct result of this rapprochement between monasticism and society in the secular world. The Centre for the Preservation of Athonite Heritage was founded in 1981. It involves representatives of the Holy Community of Mount Athos, the Greek government, and the Secretary General of the Ministry of Macedonia and Thrace, which is the civil body responsible for Mount Athos. Among other things, the Centre handles the moneys allocated for projects and works on Mount Athos. Greece's accession to the EU naturally posed problems with regard to the very special way of life on the Holy Mountain. These were resolved when Greece and the other member-states signed a common declaration safeguarding the distinctive nature and the special legal status of Mount Athos. One gratifying activity that is now taking place on Athos � though some people find it a matter of some concern � is feverish rebuilding. The ruined and dilapidated monastery buildings are rapidly being restored, which is proving to be a source of distraction and apprehension for the monks. Furthermore, the large numbers of pilgrims and visitors � who turn up almost all the year round �, machinery, and road vehicles, coupled with the present road-building activities, are taking a toll on the way and the pace of life on Mount Athos. But what tends to be forgotten is that no serious rebuilding has been done on the peninsula since the end of the nineteenth century. The natural wear and tear on the buildings requires major rectification. The growing number of pilgrims creates additional needs. And if one bears in mind that the rapid changes that have taken place in social life and technology in recent decades must inevitably affect the way and the pace of life on Mount Athos, all this may be regarded as part of the natural course of events. Andreas 1969. Mantzaridis 1973, pp. 313-28. Athonikoi Dialogoi 1973-80. Dorotheos 1985. Tsamis 1986. Christou 1987. Angelopoulos 1987. Tachiaos 1993. Holy Mountain 1996.